Do you feel called to bring care and healing to the people of the developing world? We are looking for hardworking individuals who believe change is possible not just for a week, but for a lifetime. Several times a year, OneWorld Health sends teams of short-term medical and non-medical volunteers to serve the communities surrounding our project sites. During the development phases of our medical centers, these teams provide consistent care to the region, build a foundation of quality care and advocate for the clinic that is to come. Once our medical centers are in operation, these teams support the centers by continuing to provide quality care, training and patient referrals. OneWorld Health’s short-term trips pave the way for the success of our long-term projects. OneWorld Health’s short-term trips pave the way for the success of our long-term projects, while leaving no volunteer the same upon their return home. 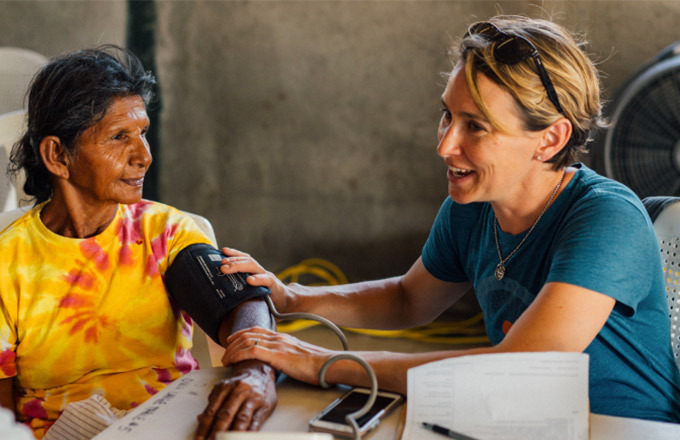 OneWorld Health is changing the nature of short-term medical missions. Our weeklong experiences provide a unique, impactful cultural and educational experience for our volunteers. Through implementing the same short-term experience across all project sites, we are able to see long-term, sustainable effects that serve the ultimate good. Each day begins with a devotion. OneWorld Health is inspired by Jesus Christ to serve people in desperate situations, and we believe starting the day with a reflection on his example gives purpose and clarity to our efforts. The local church is a conduit for change in the communities where we are serving. Recognizing this, we have strong in-country partnerships with local Christian ministries who will accompany our teams to medical outreach and provide prayer and counseling to our patients. Each day ends with a dinner to celebrate our accomplishments of the day, encourage one another and share life stories with our team. Tour the medical center or future medical center site and meet our amazing local staff. Conduct medical outreach in the villages surrounding our permanent medical center. Our volunteers are incredibly valuable in fulfilling different clinic roles such as working with the registration, provider or pharmacy teams. These medical outreaches refer patients, promote our permanent medical center and continue setting a precedent for quality healthcare throughout the region. Fun-day activity specific to the region to celebrate our accomplishments.